There are several ways to do code quality checks in SOA Suite. In this blog post I will describe a minimal effort setup which uses Jenkins 2.9, SonarQube 5.6 and the SonarQube XML Plugin 1.4.1. SonarQube is a popular tool to check and visualize code quality. An XML Plugin is available for SonarQube which allows you to define custom XPath rules. At the end of this post I will shortly describe several other options which you can consider to help you improve code quality by doing automated checks. Using SonarQube and the XML Plugin to do code quality checks on SOA Suite components has several benefits compared to other options described at the end of this post. It has few dependencies. It does not require an Oracle Home or custom JAR files on your SonarQube server. The XML Plugin has support (by SonarSource) so high probability it will still work in future versions of SonarQube. Writing rules is simple; XPath expressions. it does not require you to write Java code to create checks. What we can’t do with this setup is check relations between files since the XPath expressions are executed on single documents (defined with an Ant-style file-mask). Usually though when compiling or deploying SOA Suite composites, it will fail if there are references to files which are not present. In this setup I’ve used Git, Jenkins, Maven, SonarQube. I’ve used an Ubuntu Server 16.04 install. The installation of the tools is pretty straightforward. Git and Maven are easiest: sudo apt-get install git maven. Jenkins is also pretty easy since there is a Debian package available. See here. 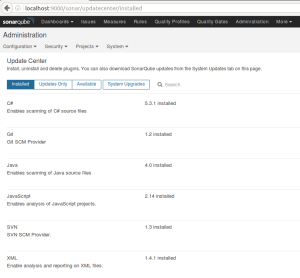 For SonarQube I’ve installed a MySQL server (sudo apt-get install mysql-server). Next I’ve used the following manual. After the installation I’ve set the default admin password to admin (see here). I have also got Sonatype Nexus 3 installed on the server. This required a bit more effort. Nexus 2.x and Nexus 3.x use different API locations. Maven needed to be able to find Nexus (settings.xml file used for Nexus 2 cannot be used OOTB for Nexus 3). The init.d script had some different installation steps. See here. Of course most people will know how to use Git. I prefer a setup in which the server has a single Git user who owns the repository and grant other users access with SSH keys to that repository. You can see how this is done here. You have to define a project in SonarQube. Administration, Projects, Management, Create Project. Read the complete article here.